The mystery of how coral reefs thrive in "ocean deserts" has been solved, scientists say. Reefs are among Earth's most vibrant ecosystems, yet they flourish in waters lacking nutrients - a phenomenon known as Darwin's Paradox. A team found that sponges keep the reef alive - by recycling vast amounts of organic matter to feed snails, crabs and other creatures. Writing in Science, they hope their findings will aid conservation. Sponges recycle nearly ten times as much matter as bacteria, and produce as much nutrition as all the corals and algae in a reef combined, the scientists calculate. They are the "unsung heroes" of the reef community, said lead author Jasper de Goeij, an aquatic ecologist at the University of Amsterdam. "Up until now no-one has really paid sponges much attention. They look nice, but everybody was more interested in corals and fish," he told BBC News. "But it turns out that sponges are big players - and they deserve credit for their role. "If you want a reef which is colourful and biodiverse, you need a 'sponge loop' to maintain it." It was during his voyage on the Beagle that Charles Darwin famously observed that tropical reefs are like oases in a desert. They are surrounded by waters lacking nitrogen and phosphorus - the building blocks of life - which ought to prohibit their growth. And since corals release up to half their organic matter into seawater, reefs need a system to recover these nutrients and recycle them into the ecosystem. Bacteria do part of the job, but are not abundant enough to service the chemical dependencies of a whole teeming reef community. Sponges (poriferans) are filter feeders which live in rock crevices, sucking up plankton and organic matter released into the sea by corals. The idea that they could be a missing link in the reef food cycle has been proposed before. But it was not clear how much nutrition they could supply, nor how exactly they feed their reef neighbours - worms, crustaceans and other sea floor foragers. 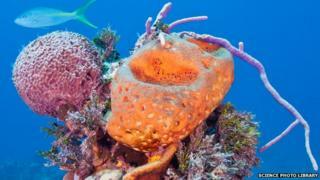 On the Caribbean island of Curacao, de Goeij and his team studied four common species of sponges - first in laboratory aquariums, then in a natural reef where the scientists sealed off a cavity. They fed the poriferans with labelled sugars - and traced these molecules on their journey. First the sugars were absorbed from the water by the sponges, then quickly shed in dead filter cells (choanocytes) - detritus which fell to the seabed. Within two days, the same molecules were present in snails and other creatures feeding on the sediment containing sponge waste. These snails are in turn eaten by larger animals, and so the cycle continues. It was not only the speed, but the sheer volume of food turnover which took the authors by surprise - about 10 times more than bacteria recycle. The sponge Halisarca caerulea for example takes up two-thirds of its body weight in dissolved carbon each day, but it barely grows in size - because old cells are shed to the seabed. In total, the Dutch team estimated this "sponge loop" produced nearly as many nutrients as all the primary producers (corals and algae) in an entire tropical reef. And other marine deserts, like deep-sea cold-water coral reefs or temperate Mediterranean reefs, may also rely on poriferans to recycle their nutrients. By recognising sponges as lynchpins - the unheralded heroes of the reef - they hope to aid conservation efforts in these fragile havens.